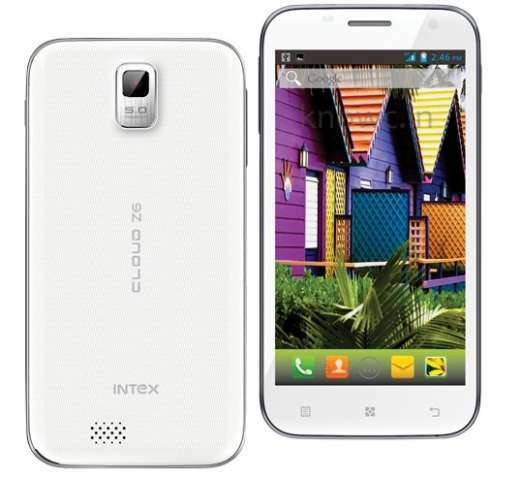 Intex has officially introduced a new budget Android smartphone in Cloud-series, the Cloud Z6. The Z6 comes with a 5inch FWVGA capacitive touch screen display, Dual SIM support and 1.0GHz dual core CPU. Well, overall there is nothing special that would attract you to buy this smartphone. It would gain more profit if launched under RS6000. It is successor to the Z5, but not in all aspects. The Intex Z6 Cloud is gains power from 1 GHz 2-core processor paired with 512MB of RAM. To make the device Run there is Android 4.0 Ice Cream Sandwich operating system, where as the latest OS is 4.4 Kitkat. The handset also lacks LED Flash and 3G network support, which would make the buyer despondent. It has 5MP primary shooter and 1.3MP secondary imager. The Z6 has 4GB of ROM and microSD card for further expansion up to 32GB. The Cloud Z6 comes in White color and its price is not announced yet. There are many phone in the market that offers much better features at budget price. It also comes pre loaded with “Racing Moto” game and has Motion Sensor, Gsensor and proximity sensor.